Join us for a mouth-watering Christmas Lunch menu in our restaurant. As with all our dishes, we focus on using fresh seasonal produce from either our own kitchen garden or local trusted sources. Here’s what you can expect for this year’s lunch. It’s a reservation only event. Call +1 (473) 442 5252 to book your spot. Here’s our Christmas lunch menu in full. Roasted Butternut Squash Soup – A velvety, flavorful soup made with roasted butternut squash and herbs accented with a swirl of cinnamon cream. Goat’s Cheese & Onion Spring Rolls – These delicious spring rolls are crunchy on the outside, filled with caramelized onions, goat’s cheese and herbs. Drizzled with a sweet chilli dressing and chopped walnuts. Garlic & Herb Roasted Beef – Enjoy this beautiful aromatic garlic roasted beef, with a crisp garlicky crust on the outside and juicy inside. Served with Yorkshire pudding and a rich beef gravy. Crumb-Coated Baked Snapper – Whole baked snapper stuffed with onions and peppers, topped with a crunchy and refreshing honey and lime slaw. Maple & Mustard Glazed Turkey – Roasted to perfection, moist and tender with our all-time favourite stuffing served with turkey gravy and cranberry sauce. Couscous Stuffed Aubergine – Aubergine stuffed with couscous, tomato, chickpea and fresh herbs with roasted red pepper and marinara sauce, topped with mozzarella and fresh basil. All mains served with twice-baked potatoes, wilted greens and a seasonal medley of vegetables. EC$165 per head, children charged accordingly. Lunch served from 12:00 noon. 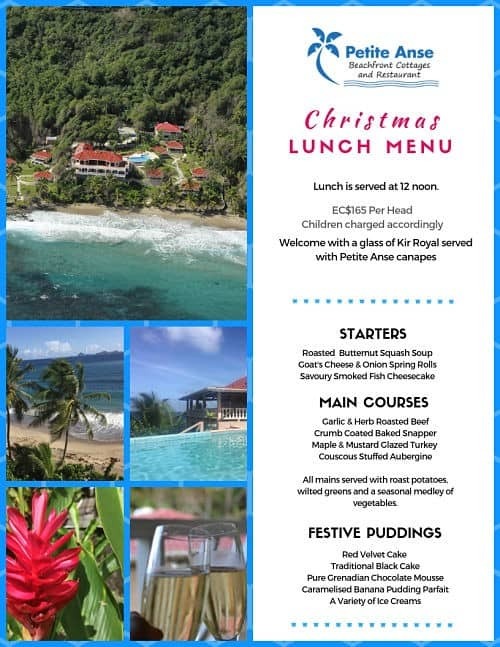 If you’re here on the island for Christmas lunch in Grenada, join us. Leave the cooking to our experienced chefs and sit back and enjoy your Christmas Day with loved ones of friends and family.